STMicroelectronics provides a comprehensive portfolio of robust 8-bit microcontrollers and high-performance 32-bit ARM-based microcontrollers with a wide range of peripherals. Extensive support through a combination of flexible and powerful development tools, training courses, consultancy and web support facilitate faster time to market. 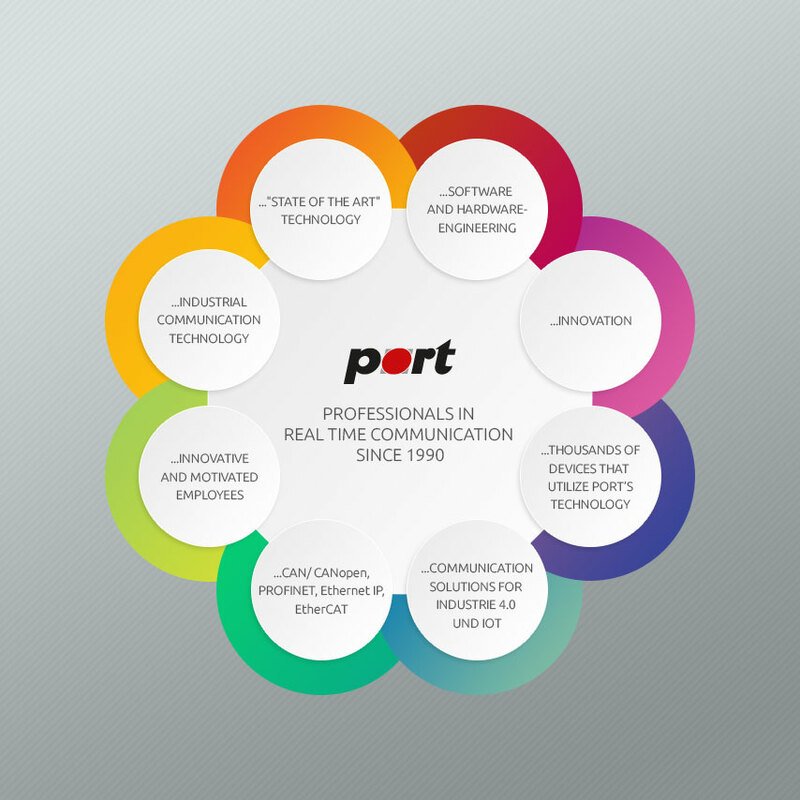 PORT offers a variety of solutions in the area of "real time communication". PROFINET, EthernetIP, EtherCAT, CANopen or Powerlink, PORT supports you in the integration and certification of your products. The STM32 family from STMicroelectronics offers you numerous possible solutions. port is "GOLD- Alliance Partner" of RENESAS. Both companies are working together on communication platforms. port is focused on the industrial application. ( RENESAS RX und RL Series). The focus is CANopen, PROFINET, EtherCAT, POWERLINK and Ethernet/IP. With over 25 years of CAN development experience and more than 30 CAN-related products to their name, Kvaser AB (www.kvaser.com) is the CAN expert, bringing its deep knowledge in the field of CAN to industries that include Automotive, Avionics, Building Automation, Domestic Appliances, Hydraulic Equipment, Industrial Automation, Maritime, Medical, Military, Railway, Telecoms and Textiles. Kvaser is headquartered in Mölndal, Sweden, with regional offices in Mission Viejo, CA in the United States, and in Shanghai, China. Sightsys Ltd is our exclusiv distribution partner in Israel. Sightsys LTD is well experienced provider of development and testing tools over 20 years. We bring innovative solutions for electronic and embedded system design, development and test to the developers in Israel, acting as a value-added provider for development teams needing a high standard of technical understanding, as well as high-class customer support. Sightsys team offers diverse world-class solutions forembedded development such as compilers, IDEs, RTOSs, Debuggers, in-circuit emulators, add-on embedded sw stacks & components and professional services.Sightsys is committed to provide a creative, ethical, enjoyable and professional working environment and to conduct our business with civility and honesty, to the benefit of our employees, principals and customers. Coressent Korea (our partner for Sales and Service in Korea) have focused on Embedded RTOS, Development tools and Technical consulting work for Mobile, Consumer and Industrial market for over 10 years. Also, We have high career level engineering resources who have worked with Korean major customers as like Samsung, LG, ETRI, etc. We are consulting and supporting Korean customers according to technical trend and Customers’ demand. Hardware startup code, Kernel porting for Firmware, RTOS and Linux, Various device driver development, Open source integration and Commercialization using RTOS and Linux. Since the year 2000 port works together with the company EMS Dr. Thomas Wünsche. The joint development of the CAN-Ethernet Gateways EtherCAN brought us broad acknowledgment on national and international exhibitions.EMS delivers CAN products and software for a wide range of industrial applications. You can reach EMS home page at www.ems-wuensche.com. I+ME ACTIA GmbH is a 100% subsidary of the French ACTIA Group. I+ME ACTIA is a specialist in the area of micro electronics and serial networks ( like CAN, VAN, J1850, ...) as well for the development of software and hardware for electronic systems. You can reach I+ME ACTIA home page at www.ime-actia.de..
Neomore proposes efficient, open and innovative solutions for fast development of embedded and real-time applications to customers in France. These solutions include computer boards, embedded BIOS, firmware tools, emulators, debuggers, compilers, operating systems, communication stacks and middleware from the worldwide industry leaders. NeoMore’s experienced engineers provide their customers with premium local support for the best-in-class General Software products. You can reach Neomore home page at www.neomore.com. port is using the DeviceNet experiences of Pyramid Solutions to provide a complete spectrum of CAN protocols in Europe. Pyramid Solutions is a recognized leader in software engineering and systems integration, with a comprehensive technical staff. The Communication Systems Group has extensive experience developing data communications solutions for industrial control and automation networks. You can reach Pyramid Solutions home page at www.pyramidsolutions.com. The company port SI-Kwadraat is a qualified partner for all questions regarding CAN technologies in the Benelux countries. SI-Kwadraat is specialised in embedded solutions regarding machines. The areas, SI-Kwadraat are working in, are networking, vision and diagnostics. You can reach the SI-Kwadraat home page at www.si-kwadraat.nl and by email info@si-kwadrat.nl. Since the year 2005 port works together with the company SSV Embedded Systems. SSV Embedded Systems is a part of the SSV GmbH in Germany. Since 1982 SSV have designed and manufactured a wide range of embedded systems, industrial computers and I/O boards. SSV Embedded Systems offers embedded PC products for industrial PC bus systems as well as single board computers, gateways and I/O boards for Ethernet- and TCP/IP- based embedded networking and embedded Internet applications. Contact SVV via www.ssv-embedded.de or jne@ist1.de. Since the year 2000 port is using the DeviceNet and J1939 experiences of Warwick Controls. WCT provide expertise, tools and development services for embedded controllers and Controller Area Networks, aimed at the automotive and industrial automation industries. You can reach the WCT home page at www.warwickcontrol.com. Analog Devices is one of the leaders in high performance signal processing solutions. Blackfin® Processors embody a new breed of 16/32-bit embedded processor, ideally suited for products where a convergence of capabilities are necessary — multi-format audio, video, voice and image processing, control processing; and real-time security. The Blackfin can be used with the uCliunx version of the famous Linux™ operating system. port developed the can4linx device driver for CAN to be used on the Blakfin uClinux version. Atmel is a worldwide leader in the design and manufacture of microcontrollers, advanced logic, mixed-signal, nonvolatile memory and radio frequency (RF) components. Leveraging one of the industry’s broadest intellectual property (IP) technology portfolios, Atmel is able to provide the electronics industry with complete system solutions focused on consumer, industrial, security, communications, computing and automotive markets. Atmel is a long-standing member of the ARM Connected Community. AT91SAM 32-bit ARM-based Microcontrollers The Atmel AT91SAM9263 can be used with the uCliunx version of the famous Linux™ operating system. port developed the can4linx device driver for CAN to be used on the AT91SAM9263 uClinux version. port has solutions for CANopen for nealy all Atmel microcontrollers ranging from 8 bit to 32 bit. Beck IPC GmbH offers customers products and services for all aspects of industrial control technology and communication. The increasing level of integration offered by Beck IPC control components, together with their ever decreasing space requirements, are outstanding features that provide the basis for many product developments in all areas of industry. Beck IPC is a reliable and valued partner, not least due to its highly qualified employees, its own development department with outstanding know-how and a rigorous quality management system. You can reach Beck IPC GmbH homepage at www.beck-ipc.com and by email info@beck-ipc.com. TASKING products are world-leading tools for embedded software development, bringing together the advanced software design technology needed to compete in the embedded applications era. The TASKING integrated development environment, compiler and debugger offerings support a wide range of DSPs and 8-, 16-, 32-bit microprocessors and microcontrollers for all areas of embedded development. With over 100,000 licensed users of TASKING products, including the world’s leading telecom, datacom, wireless and peripheral manufacturers, the range of TASKING products has a long history of technological leadership and innovation. Texas Instruments helps customers solve problems and develop new electronics that make the world smarter, healthier, safer, greener and more fun. A global semiconductor company, TI innovates through design, sales and manufacturing operations in more than 30 countries. For more information, go to www.ti.com. XILINX - FPGA technology for industrial communication. In 2007 port became a Xilinx Alliance Program member. The Xilinx Alliance Program showcases the industry’s leading third-party technology providers that are available to assist system developers to successfully complete their programmable logic designs. port offers solutions for POWERLINK, EtherCAT, EthernetIP, standard TCP/IP and CAN.